Enter your wording EXACTLY as you wish it to be printed. All of our products are printed and shipped from our print partner in the USA and are of the highest quality so that you know they will last. Boring school or work lunches? 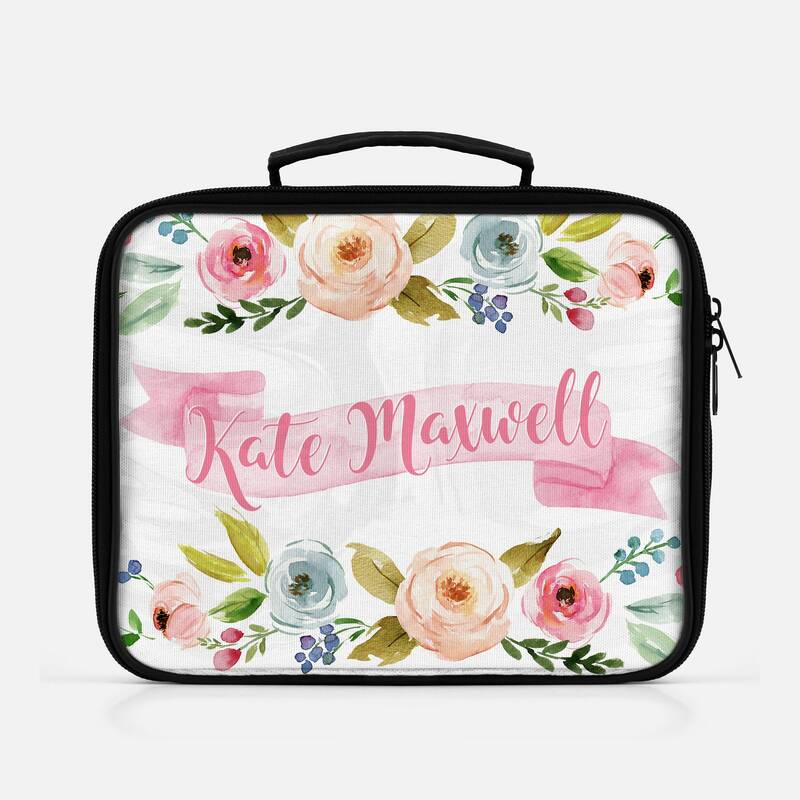 Make lunch time fun again with our stunning watercolor floral reusable,personalized lunch bag. Great for traveling, back to school or the office this insulated lunch bag will keep your lunch cool. These lunch totes make a great personalized gift for any occasion. Each bag is printed and shipped in the USA by our print partner to ensure the highest quality print each & ever time. • Please note the design is printed on an insert in which sometimes leave a small gap near the seam. • Despite every effort to accurately depict each product's color, actual colors may slightly vary due to monitor setting differences between devices. If you have any questions about colors please do not hesitate to contact us! Our current turnaround time is 2-7 business days for your order to be made. Shipping time is NOT included in production time & begins once your order has been made. Shipping times are estimates given by the postal service and are not guaranteed. Shipping can take longer due to circumstances outside our control (bad weather, postal strikes) and around all major holidays, especially Christmas. Please order accordingly. Due to the way we design and print our products (on demand just for you) this product cannot be returned or exchanged. If there is an issue with your order, please contact us ASAP with photos & we will arrange a replacement. Get 10% off your order when you spend $10 at this shop. Discount shown at checkout. Floral Lunch Tote, Floral Lunch Bag, Floral Lunch Box, Floral Insulated Lunch Bag, Personalized Floral Lunch Bag, Lunchbox, Back To School. Awesome lunch bag, perfect size, well made, unicorn pic is beautiful. Glad i bought. Received it on time, too. Adorable and well made! Shipped very quickly. Gift for my daughter that She will love! Pink Unicorn Bag Tag, Bag Tag, Unicorn, Unicorn Gift, Luggage Tag, Back To School, Unicorn Backpack Tag, Unicorn Tag, Unicorn Name Tag. I ordered 7 of these for my bridesmaids and myself and they are more gorgeous than I could ever imagine!! I am so glad I purchased these ones, they are worth it! Great quality and I love that the print is on both sides. Super cute make up bag for my six year old. We use it for dance and she loves it. It arrived faster than expected! At Pretty Little Apparel, we want our customers to be satisfied with their new purchase. As each product is made to order & produced just for you, all sales are final. We cannot accept returns, provide refunds or exchanges for any items. If a product arrives damaged or defective, please contact us within 3 days of receiving your item and we will do our absolute best to resolve the issue. Upon approval a replacement will be sent asap, at no cost to you. If your item is damaged during shipping, please notify us within 3 days of receiving your item. Upon approval of your claim, your replacement item will be sent asap. As each item is individually made, your order will be shipped 2-7 business days after your order is placed. Business days are Monday to Friday and do NOT include weekends or public holidays. Processing times (the time it takes to make your item) are subject to change. Please ensure you read our shop announcement and the listing description for our current processing time. Delivery times are separate from processing times. After your order has been completed it will be packaged and shipped. Both processing & delivery times can be found on your order receipt. Once posted you will be sent a tracking number to let you know your order is on it's way! All products are printed & shipped by our carefully selected print partner in the USA. We know you can't wait to get your item but sometimes delays do occur. Although we will help you track your item or follow up on a delayed or lost package, we cannot be held responsible for delays caused by shipping providers. Once an order has been placed we cannot change the address your order is sent to. Please make sure all your details on Etsy are correct before placing an order. Orders with multiple items may ship separately. All USA orders should be placed no later than the 11th of December. Orders after this date cannot be guaranteed to arrive in time for Christmas. For international orders, please place your order 6-8 weeks before Christmas to allow ample time for shipping. International orders can take up to 6 weeks to arrive, depending on your location, customs and normal transit delays. If your order has not arrived after this time, please contact us & we will follow up on your order for you. As an international customer you may be responsible for VAT or duty taxes imposed by your country. By ordering with PLA you are agreeing that you are solely responsible for these charges. We do not offer delivery guarantees or offer refunds or exchanges for items which arrive after an expected date, so please allow ample time when ordering. We highly recommend ordering 3 weeks in advance for all USA orders and 6-8 weeks in advance for all international orders. Mermaid Lunch Bag, Mermaid Lunch Box, Back To School, Mermaid, Mermaid Lunch Tote, Personalized, Insulated Lunch Bag, Kids School Lunch Box. Mermaid Lunch Bag Mermaid Lunch Box Back To School Mermaid Mermaid Lunch Tote Personalized Insulated Lunch Bag, Kids School Lunch Box. Llama Lunch Bag, Llama Lunch Tote, Llama Lunch Box, Llama Insulated Lunch Bag, Personalized Lunch, Llama Zipper Bag, Lunchbox For Kids,.